This new centre, housed in a stunning, historic renovated factory, presents an exciting proposition for those looking for a new home for their business in the Hayes area of London. The centre comes packed full of amenities, including modern chairs, fast WiFi, regular workshop and social events, breakout space, onsite cafe and free beverages. The centre puts a big emphasis on collaboration between members. Based in Hayes, the centre is located close to Hayes and Harlington station, which offers access to London Paddington and is due to be part of the new Elizabeth Line. This centre is located just a stone's throw from Heathrow Airport, and has been designed with international business in mind. Tenants will have 24 hour access, onsite parking, common spaces, meeting rooms, lovely furnished space, lots of natural light and cutting edge technology. As said, Heathrow Airport is within 10-minutes, and there are two Crossrail stations due to be opened by the end of 2019. Commercial property to let with flexible lease terms fully inclusive of business rates, service charges and utilities. 24 hour access and free parking available. Flexible storage and warehouse facilities also available from as little as one week to as long as required, facilitating short term fluctuations in stock, deliveries and collections can be overseen on tenant's behalf. 10 minutes’ from Heathrow Airport and close to Hayes town centre. Good public transport links to Hayes and Harlington Rail Station with easy access to A312 and M4. Situated across the fifth and sixth floors of this extensively renovated building, these fully serviced offices near Heathrow are located in a landscaped business park, just four miles from the airport. Residents of these high spec workspaces benefit from an onsite restaurant, welcoming communal reception area, air-conditioning throughout, superior technology, meeting rooms suitable for between 2 and 100 delegates and the support of an approachable and efficient onsite team. 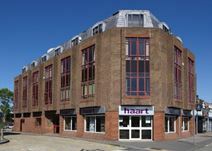 Desks start from £200 per person, per month at this business centre in Hayes, a three-minute walk from Hayes & Harlington Station which allows for fast access to London Paddington. Boutique serviced offices from one person to 25 desks. This is a very attractive and appealing office development on a highly successful business park, just five minutes’ from Heathrow airport. The building design allows for a feeling of space and light, it has many open communal spaces and is set in landscaped parkland. The business park is great for all connections to London and the surrounding area, while boasting a plethora of leisure facilities including a golf course, shops, bars and a fitness centre. Well placed for connections into London and for Heathrow, this office accommodation is within a detached, mixed use building of late 20th century construction. The building is made up of ground floor retail space as well as some residential apartments. The location is excellent for road links to the area and the wider UK with the M40, M25 and M4 all within easy reach.